Chief Legal Officer, TruFund Financial Services, Inc.
Susan Taing has more than a decade of experience advising early stage companies, financial institutions, and fortune 500 companies across a variety of matters including general corporate and commercial transactions, mergers and acquisitions, joint ventures, corporate finance, venture capital, digital media, ad tech, and privacy. At ZwillGen, Susan’s practice focuses on complex technology transactions including technology and data licensing and product development, the ad tech industry, and issues involving privacy. 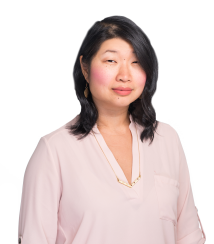 From 2014 to 2018, Susan was the Associate General Counsel at MediaMath where she helped lay the legal foundation to support the rapid growth of one of the fastest growing companies in the ad tech space. Prior to her role at MediaMath, Susan advised foreign and domestic commercial banks and investment banks, as well as private credit debt funds and public and private corporations on leveraged and acquisition finance, middle market and asset based finance, mergers and acquisitions, and hybrid transactions involving structured debt and equity investments. Susan is a graduate of Georgetown University Law Center and Haverford College. She began her career as a Law Clerk for Judge Rufus G. King, III of the Superior Court of the District of Columbia.